What I've been working on at the hospital hanging out with my dad. 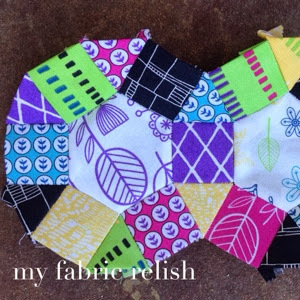 Summerville fabrics on 1 1/2 inch hexagons, squares and equalateral triangles. Not sure what they will become, but open to suggestions! I'm doing the same ferris wheel pattern. Everyone keeps asking me how big it will be and I keep responding, "As big as it gets." LOL. I like your bright colors. Haha....I started replying the same thing to the how big question! Thanks so much for the visit and comment!!! So good to have something for the fingers to do while in hospital! Oooooh....Thanks! I'm looking up the group now!! Thanks for stopping by and sharing! Looking good - it's great to have something to keep you busy! Absolutely! It keeps me from getting sewing machine withdrawal shakes. Lol thanks for visiting!! bright and colorful - love it! hope it's helping with the hospital stay. =( you are welcome to link up more than one project, btw! or you can save it for next month. whatever.